Starring Christopher Bale, Michael Caine, Gary Oldman, Cillian Murphy and Morgan Freeman, the trilogy commenced with Batman Begins, which traced the origins of how Bruce Wayne took on the role of the masked crusader to fight the forces of evil. Starring Christopher Bale, Michael Caine, Gary Oldman, Cillian Murphy and Morgan Freeman, the trilogy commenced with Batman Begins, which traced the origins of how Bruce Wayne took on the role of the masked crusader to fight the forces of evil. But the Batman's adversaries in the first film paled in comparison to the forces of anarchy unleashed by The Joker in the second film, The Dark Knight. Physically and psychologically depleted by his encounter with The Joker, in The Dark Knight Rises, Batman must marshal all his forces to meet the threat to Gotham City posed by the masked villain Bane. These three films form a trilogy unique in the history of cinema - and express a dark imaginative vision that reflects the uncertainties of the 21st century. 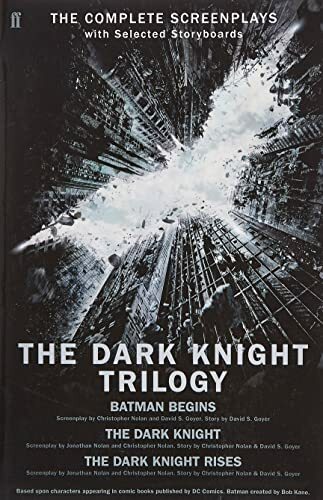 Nominated for thirteen BAFTA awards and nine Oscars, the Dark Knight Trilogy starred Christian Bale, Michael Caine, Tom Hardy, Gary Oldman and Morgan Freeman. Christopher Nolan's other films include Insomnia, Momento, Inception and most recently Interstellar starring Matthew McConaughey and Anne Hathaway.